Welcome to the latest of my random musings, and today I wanted to talk a little bit about distraction. First off I think I need to explain exactly the type of distraction i mean. A few posts ago, I mentioned that I'd decided to concentrate on my bloodstone knights for a bit in terms of painting. Yeah that went well, a couple of friends of mine who I've been playing necromunda against are getting into 40k, and invited me to go and spend a day playing 500 point games of 40k at the end of April. Erm, yes please! I cleared it with my wife, and as luck would have it that particular day she has a friend coming over to see her and our daughter so me being out of the house was fine. 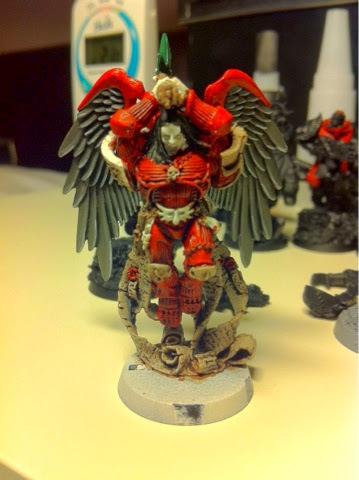 There was just one problem, I didn't really want to try and assemble a 500pt army from the blood angels stuff I've got (it would be horribly unbalanced for starters). As a result, the bloodstone knights went back in their box once the sternguard were largely finished, and two iron fists tactical squads started getting some attention. 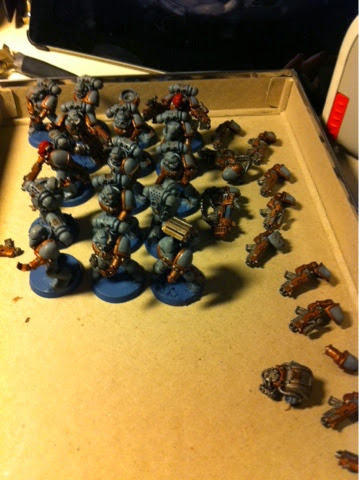 As I'm writing this, my eyes are recovering from painting base coats, scrolls and armour washing 16 tactical marines. They're now just about usable, but need as much time again to be finished. In the meantime of course, I've now got a game with my bloodstone knights arranged for next week, so plenty more frantic work on the horizon. So back to the main topic then, and hobby distractions, good or bad? Well I'd have to say in this instance very good, as although I can't wait to get my bloodstone knights onto the tabletop, I now have 4 viable troops units for my iron fists, 2 bike squads and 2 tactical squads, but more importantly, I've had a significant sense of purpose over the last couple of days painting these guys up, I'm even looking forward to getting some bases done for them to match those I've done for the bikes. Of course it's not such good news for the bloodstone knights, but I'm still looking forward to doing some more on them in the near future, in fact I need to get them at least tacked together for next club night! Hi all, those of you who read my post yesterday will know I've got some 500pt games arranged at the end of April, so today I thought I'd post up a few thoughts about tactics and list building in smaller games. Evening all, and welcome to another Monday hobby update, this week I've got the latest pictures of my sternguard for you, along with a few pointers as to the games and events I've got coming up soon. Without further ado then, here are close ups of the sternguard as they stand this evening (I'm hoping to get more done on them later once the good lady wife has gone to bed! In-game he may or may not take the power sword, depending on points available and my opponent. Further down my painting list is the Soarta Squad, who you can see here supported by Ancient Nemirul, the Death Company Dreadnought. Also in the picture is Vlad Stoichita, who longer term readers may remember as the first of the Soarta that I completed. In terms of the Value Project, that puts the sternguard at roughly £5.30 per hour I've spent on them (which includes their drop pod, on which there's plenty still to be done! In terms of games therefore, I'm testing out the bloodstone knights this week at my club and then next week I'm hopefully going to be doubling up with another blood angels player for a 3000 point MAD DoGS game, opponents yet to be decided. 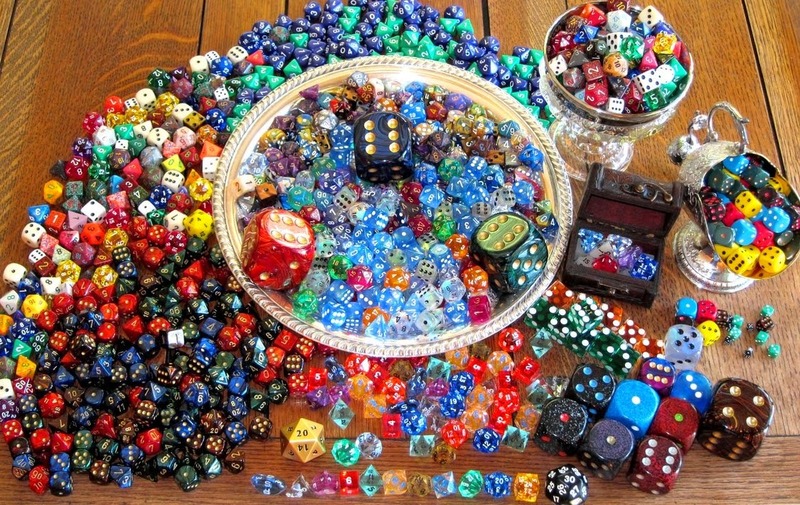 Hi all, extra bonus post for you this week, as I've just taken delivery of some new dice and I've been thinking quite a bit about them since last week's nightmare. Morning all, another Monday report eh, they do come round quick don't they! Fairly brief one today for you though, as last week I didn't get much done besides tidying up my kill team with a last few details (ironically after the event, I then dropped them in the car park so they'll need some repair work before I can use them again). Apart from that, last week's measly painting efforts were spent giving some love to my bloodstone knights once more (for those of you who don't like red marines, this could be a bad month). With that in mind, here's the latest work on my favourite named character in the book, Astorath the Grim. Next on the bench for attention is the sternguard squad and their drop pod, which is coming along nicely. 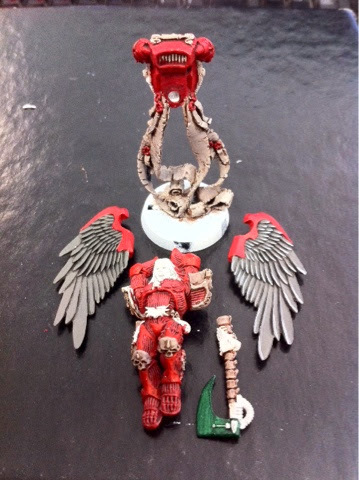 Also needing brushwork are the Soarta, the Sanguinary Guard, a Tactical Squad and an Assault Squad, pics of progress so far follow. 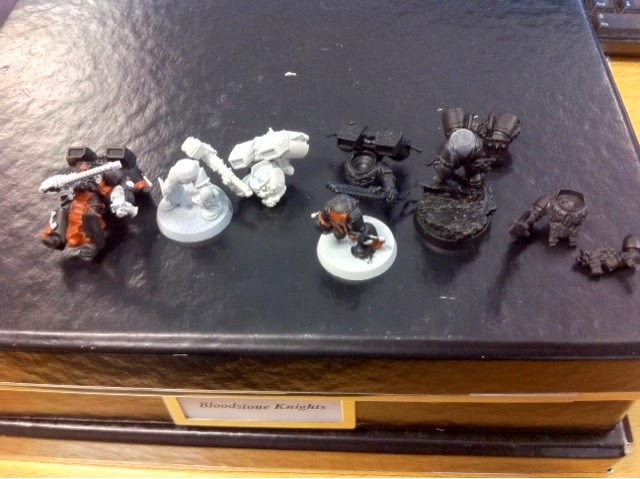 Hi all, so I'm writing this post before the Dirty Sevens event at my local club, which is a kill team event played over the course of one evening. Each of the seven participants will play six games with a one game break at some point in the evening. There are several reasons for this, the first being that the first time I ran something like this, the eighth player dropped out. Turns out that was a good thing though, as it's fast and furious trying to fit them all in anyway, and a half hour mental rest is a good thing. It also means we have one spare player to take pictures of the games going on for a write up afterwards. So a few thoughts about kill team itself then, which has changed since the last dirty sevens just before Christmas last year. You now need a minimum of 4 models (that's one of last years teams out then!) that's three specialists plus a leader, with the specialists skills broken down into 5 different categories. We also now have six missions to choose from, though that makes splitting players by victory points more difficult. I'm going to give it a go though, but might revert back to a single mission next time if it doesn't work. On to individual tactics then. Your first decision in choosing your team is whether to go for lots of cheap models, a few elite ones, or a mix of the two. None is an automatic ‘win’ choice, though swamping your opponent with lots of models can make things difficult for a truly elite opponent. Next, you need to think about vehicles. They’re limited under these rules, but even with that limit many (not all!) kill teams will struggle to take down armour. Next up is combat – and bear in mind that unless you’re facing an opponent who also wants to get in close, combat can be tricky to initiate without taking some method of moving much faster than your opponent. Your main decision however is which unit(s) you go for in the end, and I have one simple rule here that I use when picking a kill team. Always choose a unit that has special rules. Specialists are a bonus in kill team, and the special rules you choose will make a difference in the game, so by choosing a unit that already has some special rules, you’re getting the jump on an opponent who takes basic troops (take for example the Legion of the Damned. All their firepower ignores cover, meaning you can make your specialists even better). The first mission is a straightforward scrap for objectives, and therefore positioning at deployment is a crucial part of the game, setting up fire lanes to keep your opponent off objectives if you’re placing the majority, or having a sufficiently strong force to claim an enemy held objective will be key to winning. Similarly, keeping an opponent’s fire from causing you casualties is also important, since each model killed affects you far more than in other games. 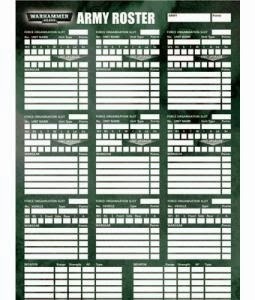 Mission 2 is a night search, and so night fighting rules are on for the whole game, plus part of your kill team may start by outflanking. I’ve played this mission before and 60% of my team decided they were searching somewhere else, which really hurt me against a team that was all there from the start. Putting that random element aside however, it’s then a straight fight as before but in the dark. One tactic that’s viable in this mission however, particularly if you win the roll off to place objectives, is to deploy right over to one side of the board, since any opponent models outflanking may then arrive on the other flank, unable to affect the outcome of the game. Choice of units becomes important in this game, since night fighting can really boost a team’s survivability. Taking models with the night vision rule or weapons that ignore cover give you a big advantage in this mission. 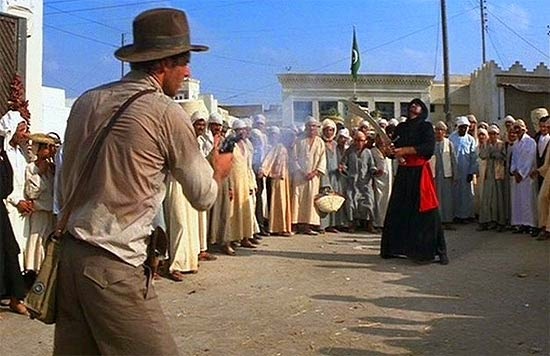 The third mission is a headhunt, pure and simple, with victory points on offer for the leader and the three specialists on the opponent’s team. Needless to say therefore that protecting your own guys is priority one in this mission. I’d strongly recommend deployment out of sight, and if viable, keep them out of sight during the game, since any casualties from specialists or your leader not only reduces your effectiveness, puts gives victory points to your opponent. If you must reveal your specialists to the enemy, try to do it in such a way that the only model that can see them is their target, and make sure you’ve got a better than even chance of taking them down. Mission 4 is basically a breakthrough mission, with the attacker trying to exit the table via the defender’s table edge, and the defender trying to cause maximum casualties. As an attacker, you can’t use the outflank special rule, so infiltrators and scouts are great for achieving your objective. That’s not to say that you should place them carelessly, or in the open however, since the defender will get points for killing your models you need to hop from cover to cover, running if necessary. Clearly the faster you can move in this mission the better, so jump troops and bikes will also help enormously. As a defender, you’ll need to spread your net wide to prohibit deployment of infiltrators too close to your board edge, whilst trying to remain dense enough to put up a decent weight of fire should your opponent aim for one exit point on the board. Mission 5 is basically capture the hill, with the win going mainly on how many models are within the central hill terrain piece. This mission clearly favours a kill team with massed numbers of models moving quickly to the centre, or a kill team with sufficient firepower to take down a substantial number of the enemy and then quickly relocate to the board centre. The final mission is effectively a search and hold type, with your kill team (and your opponent) rifling their way through objective markers to find a crucial supply crate. Again, fast moving units are the order of the day here, since being able to identify the supply crate before your opponent and then relocate to defend (or take) it will give you an advantage. Bikes, jump troops etc are the order of the day therefore! So there you have it, my take on tactics for kill team and its missions. 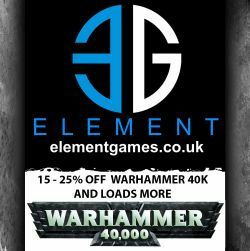 Hope you enjoyed the read, and it gives you some incite and encouragement to pick up the rules and give this version of the game a go – the reduced numbers of models make for a tactically interesting challenge very different to a typical game of 40k, where increasingly size matters. 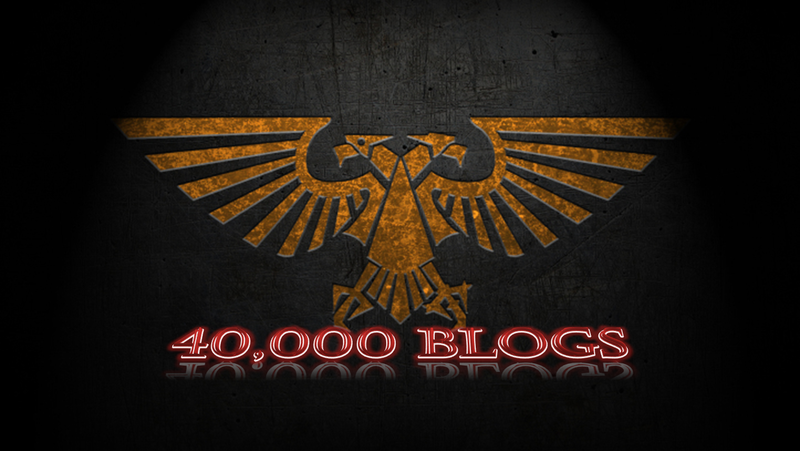 Hi all, my first random musing for a while, and it's inspired really by another blog I frequent occasionally and its review of the space marine codex. 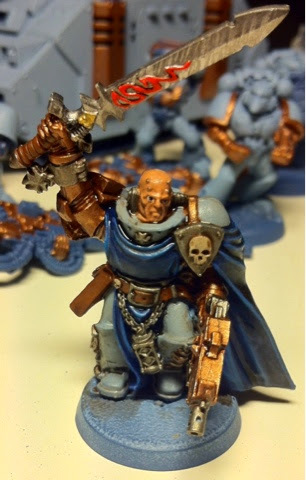 Now I'll admit I'm a big fan of the current codex and the balance it has, but the review I read felt like that of a different book, and when I read it again I realised why - it seemed to really focus on the negatives and why this unit didn't have access to this weapon, or why this piece of wargear should be left behind. 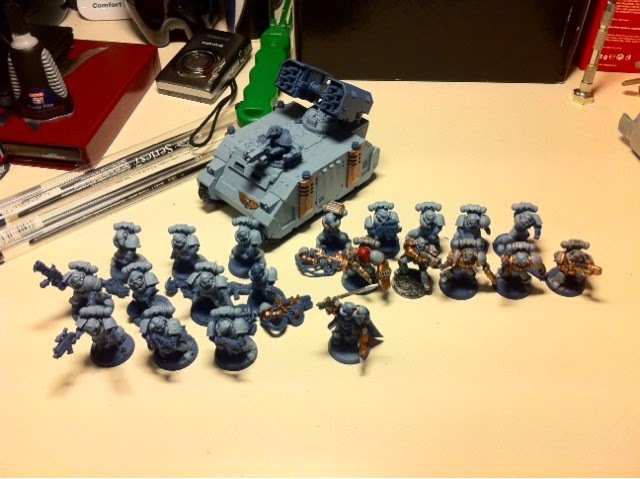 Hi all, here's today's post on the topic of picking a new army and list with a theme in mind. Hi all and welcome to another Monday in my hobby world. I generally use Mondays as a time to look both back and forward, back at what painting etc I've managed in the last seven days, and forward at what's coming up over the next seven. Limited painting progress this week I'm afraid to say however, I managed a few little updates to my kill team but nothing major, needs to be finished by Thursday though so could be a late one this week! What I did manage to achieve though was to sort through many of the models I've had earmarked for my iron fists collection, attaching heads, arms and guns to get them ready for painting and looking a bit more like crusaders. As such I've now got three full tactical squads ready to go, along with my terminator captain (possibly my favourite marine model of all time) and quite a lot of terminators (23 to be precise) awaiting a new can of undercoat. Next up for sorting will be my assault marines, as I've got plenty of them sat around waiting to be used. Who knows, I might even look at updating a couple of razorbacks too. 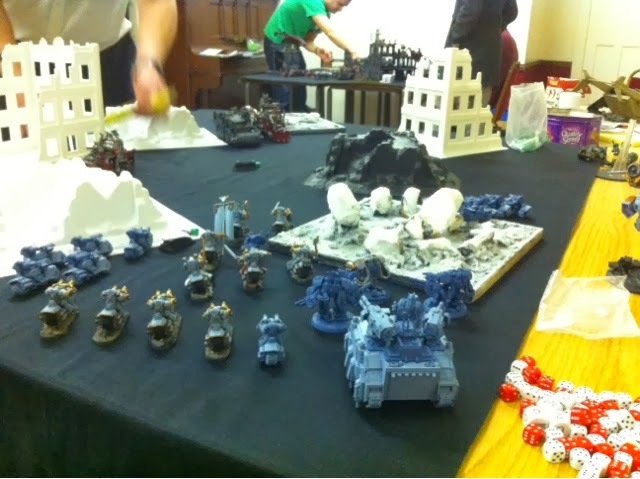 Hi all, so today I've got a battle report for you, the final games of the It's War campaign I've been running at our club with the assistance of Frank over at 'The Eternal Wargamer'. The final matches are two doubles games using 1500 points per player. 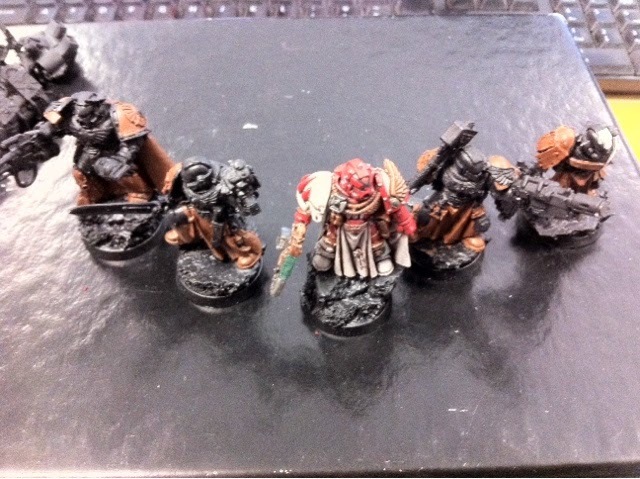 I'm teaming up with Andy's Imperial Guard to take on Frank's Dark Eldar and MJ's Tau. We've added a little twist to the last games, allowing players to swap 500 points of their list. I know it’s been a while since my last post, I had a week away from things last week, though it has meant I’ve made a lot more progress on models than previously. So in today’s bumper edition, I’ve got painting and modelling updates, a brief summary of my last battle report, and a look forward to what’s coming up in the weeks ahead at MAD Wargaming.